Presidential elections have a number of distinct features, which are different from those of premier elections. For example, unlike premier elections, presidential elections are zero-sum games and single-seat contests. However, these distinct features of presidential elections have barely attracted the scholarly attentions that they deserve. Oftentimes, these features are explained in the margins of plurality and runoff systems. 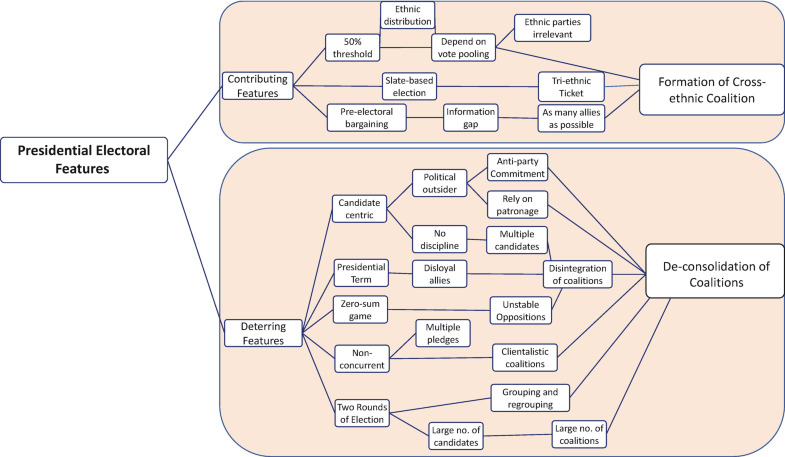 Sometimes, the literature tends to draw conclusions based on evaluation of just one or a few presidential electoral features (rules) in isolation and, therefore, misses some of the important effects that can be caught only with a wider lens. For example, Juan Linz (1994), Arend Lijphart (1977), and Juan Linz and Alfred Stepan (1996) point to the zero-sum game and candidate-centric features of presidential elections as evidence that presidential systems are unfit for coalition-building and power-sharing (Linz 1994, 21–23, 42–46). They argue that even the most successful presidential systems are linked with undisciplined parties and coalitions because presidents are less dependent on such organizations for winning and holding their offices (Mainwaring and Shugart 1997, 450). Further, power-sharing is meaningless in presidential democracies because an elected president is almost inevitably from one of the ethnic groups (Lijphart 2008, 169). On the opposite end, Donald Horowitz (2001), Gary W. Cox (1997), Maurice Duverger (1984), and others have emphasized that being one-seat elections and prone to pre-electoral bargaining, presidential elections are conducive to coalition-building and power-sharing. They have referred to the examples of Nigeria, Sri Lanka, and Indonesia, all of which abandoned the parliamentary system for a presidential constitution primarily for the purpose of nation-building and party development. They have also argued that it was presidential offices rather than anything else that led to a two-party system in the United States and two political blocs in France (Cox 1997, 188; Duverger 1984, 97; Suleiman 1992, 142). This chapter indicates that these scholars come to different conclusions because they have examined different features of presidential elections in isolation. No one electoral feature alone can explain the conduciveness (or lack thereof) of presidential systems to coalition-building. To understand how presidential elections influence cross-ethnic coalitions in a particular social setting, all electoral features must be studied including those of the electoral system. In case of Afghanistan, presidential elections are candidate-centric, zero-sum games, prone to pre-electoral bargaining, majoritarian, double ballots, religiously exclusive, and constrained by electoral cycles, as well as presidential term limits. 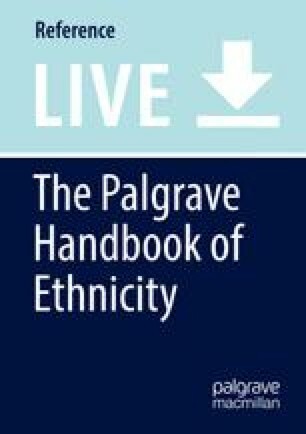 Examining all these features, this chapter reveals that they do not function cohesively and unidirectionally: while some contribute to cross-ethnic coalition-building, others function in the opposite direction. This has been the most likely reason that most cross-ethnic coalitions were able to form in the presidential elections, but these coalitions were rarely ever able to survive after or even during elections. In other words, if we divide the process of coalition-building into two simple phases of formation and consolidation, some electoral features contribute to the former phase, while others deter the latter. The relationship between these features and development of cross-ethnic coalitions is illustrated in the following figure (Fig. 1). The following sections begin with explaining the contributing features of Afghan presidential elections. The subsequent section examines deterring features of presidential elections and their influence on halting or even reversing the consolidation of coalitions. Several new democracies have recognized some of these deficiencies and have attempted to remedy them through legal manipulations such as mandating party nomination, concurrent elections, co-presidency, superlative voting system, distributional threshold, legislative runoff, threshold adaptations, and many more. Further research is required to investigate the impacts of these electoral remedies for presidential elections in different sociopolitical contexts. While it may be true that a single presidential office cannot be distributed among different groups, this office has indeed functioned as a unifying force as it has encouraged vote pooling and interethnic accommodation in Afghanistan. In other words, unlike the multi-seat Wolesi Jirga (WJ), where ethnic votes are easily translated to ethnic share of seats, the unipersonal nature of the presidential office has compelled ethnic groups to form alliances in order to share the resources that come with that office. This is primarily because as head of the state and the government, the office of the president is the highest office in the country, raising the stakes for any ethnic group in the presidential elections. To date, most cross-ethnic coalitions have been formed to compete in presidential elections than in parliamentary ones: a ratio of 21 to 2. The vote pooling effect of presidential office is reinforced by vice-president candidates also running alongside presidential candidates. In fact, one can argue that Afghan presidential elections are not unipersonal but slate-based elections where each slate (presidential ticket) includes two vice-president candidates as well. In order to win votes across ethnic groups, the first thing that most presidential candidates tend to do has been to choose their running mates from two different ethnic groups. Afghan elections have indicated that picking the right VPs more than anything else determines the viability of presidential candidates. Those who are able to pick the most prominent elites from different ethnic groups as their running mates have more chances of winning than those who do not. At times, VP candidates have contributed more votes per capita – or an equal proportion of votes – from their constituencies to their ticket than presidential candidates. This was indeed the case in the presidential election of 2014, when Abdullah’s ticket received as many votes from Hazaras as from Tajiks per capita and Ghani’s ticket secured even more votes from Uzbeks than from Pashtuns per capita (see Fig. 2). 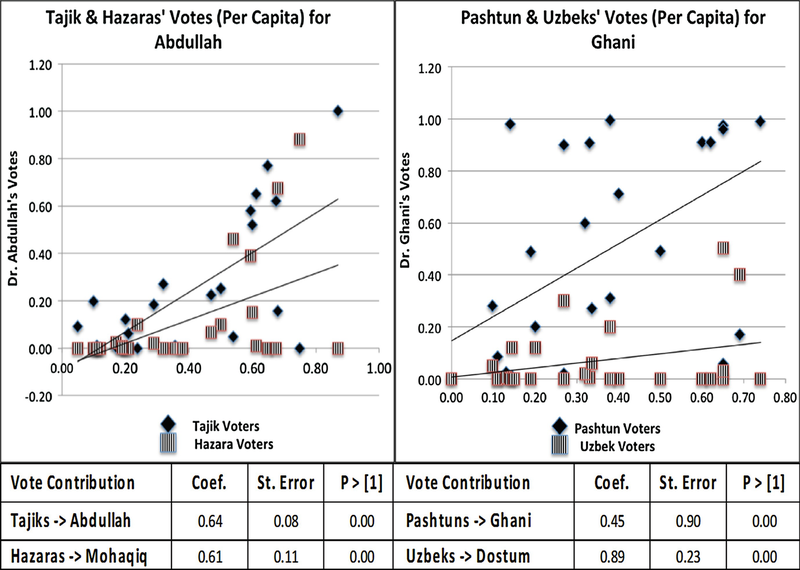 Most Hazaras voted for Abdullah primarily because of his VP running mate, Haji Mohaqiq, and most Uzbeks voted for Ghani because of his second vice-president candidate, Dostum (Mobasher 2016, 403, 408). Another feature of Afghan presidential election is that they encourage pre-electoral coalitions. Afghanistan is not a unique case in this regard as studies have shown that most presidential democracies, unlike parliamentary systems, inspire pre-electoral (proactive) coalition-building (Mainwaring and Shugart 1997, 466). The advantage that pre-electoral coalitions have had in Afghanistan is that they have been more amenable to cross-ethnic votes and alliances. The main reason for this tendency has been that candidates and voters did not have perfect information about the viability of candidates and the optimal size of winning coalitions. Not knowing the optimal size of support to win the office, serious candidates were very likely to form maximally inclusive coalitions. Similarly, the absence of such information has compelled voters and elites to cross identity lines in order to join winning coalitions and ultimately to gain access to government resources. Nonviable parties and elites would have rather joined or forged viable coalitions than compete in the election on their own. Abdul Rashid Dostum and Haji Mohaqiq learned this lesson the hard way. By running for presidency against Hamid Karzai in the election of 2004, they eventually sidelined themselves in his forthcoming government. Since then, they changed their electoral strategies in the next two elections by putting their endorsements up for bids by viable candidates instead of running for the office themselves. In the election of 2009 and 2014, the new strategy helped them gain several seats in the cabinet for their parties and even become vice-presidents themselves (2014). The other advantage of pre-electoral coalitions concerns their tendency to produce ethnically inclusive cabinets since one way to compensate pre-electoral allies has been through portfolio allocation (Sharan 2014, 142–145). In fact, political distribution has been the main bargaining chip for pre-electoral coalition making. As a result, for the first time in history, Afghans have witnessed a relatively inclusive form of government. All three administrations, so far, began with cabinets representing different ethnic groups less or more proportionally, although, overtime, with each new administration, Pashtuns have been gaining more seats while Tajiks losing seats in the initial cabinets. This slight shift in proportionality of seat allocations can likely be explained by the balance of the political dominance between these ethnic groups. After the collapse of Taliban in 2001, Tajiks had more military and political dominance than Pashtuns; but as the balance of power has gradually shifted, so did the share of their cabinet seats. Table 1 indicates that some smaller ethnic groups were also able to obtain some cabinet seats in two of three administrations. Many others were mostly given secondary positions in the government. In other words, in addition to portfolio allocation on the cabinet level, presidents have used second-ranking positions to satisfy their allies, especially those from smaller groups such as Baloches, Pashaees, Qozloqs, Bayats, Ismailis, and others. The secondary governmental posts include governorship of provinces, ambassadorial positions, spokesperson positions, and positions in other ministerial and non-ministerial agencies (Sharan 2014, 146). Article 61 of the Afghan Constitution sets a runoff system that requires presidential candidates to win an absolute majority of votes in order to become president. If no candidate wins over 50% votes in the first round, a second round of election will be held between two front-running candidates, one of whom will naturally win an absolute majority of votes in this round. Requiring the 50% threshold has corresponded very well with the ethnic distribution in Afghanistan. Assuming election results reflect ethnic headcounts, the 50% threshold compels presidential candidates to win support and votes from more than one ethnic group because none of the ethnic groups alone can deliver 50% votes. Unable to mobilize and deliver 50% votes, ethnic parties have become almost irrelevant in the presidential elections. In fact, during presidential elections, parties tend to split into factions only to forge cross-ethnic alliances with other factions. All three presidential elections have witnessed the fractionalization of some prominent ethnic parties including Jamiat-i-Islami, Hizb-i-Islami, and Wahdat-i-Islami. The tripartite interaction between presidential office, the winning threshold, and population distribution has produced two ultimate outcomes. First, ethno-political elites and voters alike have been compelled to strategically coordinate across ethnic lines. As Table 2 indicates, 16 coalitions were formed before the presidential elections, and only 7 coalitions before parliamentary elections, 5 of which were actually preparing for presidential of 2019 rather than parliamentary election of 2018. The fact that most cross-ethnic coalitions have been developed in preparation for presidential elections and not parliamentary elections shows the influence of these features of presidential elections in Afghanistan. Source: The information is gathered by the author from a number of sources including Afghanistan Analyst Network and Afghan Biographies: Who is Who in Afghanistan? The second outcome, which stems from the first one, is that moderate politics has dominated electoral politics since extremist political forces and candidates have naturally been unable to draw cross-ethnic alliances and votes (Stoll 2013). As such, it should not be surprising that candidates affiliated with well-known extremist parties and groups such as the Taliban and Hizb-i-Islami (Islamic party, military faction) have won only a handful of votes in presidential races. For example, Mullah Abdul Salam Rocketi, a former leader of Taliban who continued to show solidarity with Taliban ideologies to date, won less than 0.5% votes in 2009. Having no chance of winning cross-ethnic votes, his viability amounted to merely 4.4% in his home province of Zabul. Similarly, Qutbuddin Hilal, a loyal to Gulbuddin Hekmatyar (an internationally wanted leader until 2016), won less than 2.8% of the votes in the presidential election of 2014. Despite encouraging cross-ethnic coalitions and power-sharing, presidential elections have not been fully conducive to ethnic accommodation. Power-sharing have been shuddering, ethnic tensions have continued to challenge election aftermaths, and cross-ethnic coalitions have remained unstable. Many coalitions have either dissolved or reformulated during elections; others split immediately after elections. Most coalitions have been built on the basis of patronage and personal politics while lacking titles, structures, and ideologies (Mobasher 2016, 364). Notably, their number has been on the rise, indicating a trend resembling party fragmentation in Afghanistan. These shortfalls have been mainly because of some deterring features of presidential elections; these features include presidential elections being two-round system, candidate-centric, zero-sum games, bound by presidential term limits, nonconcurrent with parliamentary elections, dual legitimizer, and religiously exclusive. Article 61 of the Afghan Constitution requires holding a runoff election if no candidate wins an absolute majority in the first round. This requirement, indeed, forced almost two of three presidential elections in Afghanistan to a second round of voting. In the presidential election of 2009, Karzai’s votes fall a few thousand votes below the 50% threshold after a recount of the whole tally. Therefore, there would have been a second-round election should his rival candidate, Abdullah Abdullah, have decided not to withdraw. In the presidential election of 2014, a chaotic runoff election took place after an undecided first round when none of the contenders were able to win the 50% threshold. Afghan presidential elections as well as studies elsewhere have indicated that a potential runoff encourages a large number of candidates – and so fragmented coalitions. It is because a mere likelihood of a second round incentivizes not just one but three categories of candidates to enter the competition: the first group is the “office seekers” who need to follow a winning strategy by making alliances across ethnic groups (Mobasher 2017). The largest coalitions in the first round are formed by this category of candidates. The second category of candidates that the runoff system incentivizes is the “runoff-seekers.” These are serious, but not necessarily the most viable candidates who run in the first round with a hope that they may be able to finish as the runner-up. Finishing as a runner-up allows them to compete with the front-runner, having the chance to win the alliance and vote shares of the losing candidates. The success of the second-place candidate is more probable when a majority of voters dislike the top finisher, or when, in a divided society, the top finisher is from a smaller group. Indeed, one of the reasons Abdullah led the candidates in 2014’s first round was the split of Pashtun votes among seven different Pashtun candidates (Mobasher 2017). A survey before the second round of the 2014 Afghan election indicated that Ghani’s votes among Pashtuns would increase from 49% in the first round to 75% in the second round. The third category of candidates that the runoff system encourages are “patronage seekers” who enter the fray only to gain political leverage against other candidates (Mobasher 2017). Indeed, in Afghanistan, many candidates enter the election only to bargain their support with runners-up in the second round (Bijlert 2009, 9). Knowing that they have the opportunity for strategic coordination in the second round, most candidates prefer not to withdraw in the first round. The first round is indeed an investment juncture for these patronage seekers who would eventually make coalitions with one or the other front-runner in the second round. As a result, presidential elections tend to experience two rounds of coalition-making: proactive coalition-making and second round coalition-making (see Blais and Indridason 2007, 194). The former strikes before the first-round elections and the latter when eliminated candidates join the competing ones in a runoff. Afghan elections have indicated that proactive coalitions are a combination of numerous oversized coalitions supporting serious candidates and fragmented coalitions supporting opportunist candidates. The second-round coalition-making begins when the losing coalitions of the first round dissolve only to regroup with front-running coalitions. This suggests that no one coalition remains intact within two rounds of a given presidential election. For example, in the second round of 2014, after forming new alliances with losing candidates (coalitions), Abdullah and Ghani’s coalitions not only changed in sizes but also became less cohesive and ideologically indistinguishable. Such constant formulation and reformulation of coalitions in the first and second rounds have not allowed coalitions to grow and institutionalize (Mobasher 2017). Article 62 of the constitution, which lists qualifications for presidential candidates, refers to the presidential candidates merely as “individuals” and has no reference to political parties or coalitions at all. Subsequent regulations including the Regulation on the Registration of Candidates, issued by the Independent Electoral Commission, have allowed presidential candidates to run as either nominees of parties/coalitions or independent candidates. In this way, Afghan laws established a candidate-centric presidential election where it is the individual candidates and not parties and coalitions that are at the center of electoral politics. Many scholars have argued that this candidate-centrism is a universal feature of presidential elections across the world, but it is not. An increasing number of presidential constitutions such as constitutions of Indonesia, Nigeria, Kenya, Tanzania, and Sri-Lanka require their presidential candidates to be nominees of a political party or coalition. In case of Indonesia, the candidate should not only be member of a party or a coalition but also that party must control over 3% of seats in the legislature. In these five countries, political parties and coalitions have control over the nomination of candidates; thus, candidates will have to comply with their rules and policies. Political outsiders are unlikely to be able to compete in the elections unless they gain the nomination from a political party or coalition. This way, presidential elections in these countries have functioned similar to elections in parliamentary systems. The candidate-centric elections in Afghanistan have frequently undermined the power of parties over the nomination of their candidates. Unlike parliamentary systems, where prime minister nominees have to retain the confidence of their parties, candidate-centered presidential elections have liberated candidates from any such obligation in Afghanistan. This issue is coupled with public disaffection toward political parties, which explains why many party members are likely to run as independent candidates or to defect their parties altogether. Notably, the number of party members who run as independents in presidential elections is higher than those who ran as party candidates: a ratio of 11 to 10. And the elections have indicated that the trend has seemingly been toward further partyless presidential elections. In 2004, only half of the candidates who belonged to political parties registered as party candidates. In the presidential election of 2009, only one-third (38%) of party-affiliated candidates registered as party candidates, and that fraction dropped to one-fifth (20%) in the election of 2014. To the surprise of most experts, even the leaders of the four largest parties in Afghanistan including Jamiat-i-Islami, Wahdat-i-Islami, Jumbish-i-Islami, and Hizb-i-Islami ran as independent candidates in the past three presidential elections (see Table 3). Source: The information is gathered by the author from a number of sources including Independent Election Commission of Afghanistan, Afghanistan Research Evaluation Unit, and Afghan Biographies: Who is Who in Afghanistan? Although almost all presidential candidates formed some type of formal or informal, large or small, patronage or policy-based coalitions, none registered as nominees of their coalitions. In fact, Abdullah was the only candidate who registered as a coalition nominee on the preliminary list of candidates in 2014, but he later changed his affiliation to a party nominee. In such candidate-centric elections, where coalitions have no official role to play except for facilitating exchange of votes to patronage, coalitions are likely to remain clientelistic and short-lived. The personalization of elections has also contributed to fractionalization of political associations by simply allowing or even encouraging multiple members of the same party or coalition running in the same election, competing with one another. Fragmentation of Jamiat-i-Islami in all three presidential elections illustrates this well. In 2004, the party had two presidential candidates, namely, Yunus Qanuni and Abdul Hafiz Mansoor. Hafiz Mansoor ran as an independent candidate, while Yunus Qanuni attempted to form his own cross-ethnic party, Nazat-i-Mili Afghanistan. Ahmad Zia Massoud, another member of Jamiat-i-Islami Party, joined Karzai’s ticket as his first vice-president. In the presidential election of 2009, the Jamiat party split again into two large factions. One faction was led by Abdullah Abdullah who registered as an independent candidate while forming a broad coalition. Another faction endorsed Qasim Fahim who joined Karzai’s ticket as his first vice-president candidate. Likewise, the party split in the election of 2014 when Abdullah Abdullah run as the nominee of the party while his fellow party members, namely, Ahmad Zia Massoud and Ismael Khan, made alliances with two rival candidates as their running mates. It bears mentioning, however, that Jamiat has not been the only party fractionalizing in the presidential elections. Other political parties and coalitions such as Wahdat-i-Islami, Hizb-i-Islami, Kangra-i-Milli, National Coalition of Afghanistan, National United Front of Afghanistan, and National Movement of Afghanistan have fragmented as well either temporarily or permanently. An additional consequence of candidate-centric elections has been that political outsiders were not only allowed to run but also able to win the presidency. President Karzai and President Ghani have both been political outsiders, whose main theme of electoral campaign was to blame traditional parties and elites for the past atrocities in Afghanistan. Generally, political outsiders are described as some populist candidates who are not (or pretend not to be) active members of any registered political party or coalition, who likely lack political establishment experience, and who mostly launch antiestablishment campaigns (Linz 1994, 26). These candidates are particularly favorable when the voters are frustrated with the performances of the establishment and look for a new “savior” (Linz 1994, 27). Indeed, for this very reason, President Karzai and President Ghani have had the upper hand in Afghan presidential elections. During their electoral campaigns, they warned voters of returning to past atrocities should they vote for the establishment parties and elites. The issue with these political outsiders has been that they remained committed to anti-partism even after winning the presidency. They have both publicly revealed their disdain toward parties. In their own administrations, both have pushed for the adoption of SNTV system for parliamentary elections, which has been disastrous for development of parties and coalitions. They even encouraged their cabinet members to disassociate from their parties in order to keep their positions in the government. Even when they ran for presidency, instead of forming an official coalition with a constitution, an organization, and distinct policy platforms, they relied on patronage in order to make allies. In fact, they referred to their alliances as team-i-Intekhabati (electoral teams) rather than political coalitions or parties. While instrumental in helping these candidates to win presidency, the clientalistic electoral teams have proven to be coalition of convenience rather than stable political organizations. The zero-sum game feature of presidential elections can partly explain why the opposition coalitions have been unable to survive and consolidate. It reflects an electoral pattern where the winner takes all and the loser loses all. Unlike parliamentary systems, where the losing coalitions typically gain at least a few legislative seats, and therefore, a critical platform for advancing their agenda, in presidential elections in Afghanistan, the losing candidates remained empty-handed for the full presidential terms. Besides, presidential elections were not held concurrently with parliamentary elections so that the losing coalitions in presidential elections would have won at least a number of seats in the WJ. Under a situation where the losing coalitions have few resources and no platforms to voice their agendas, opposition coalitions are overburdened with the cost of sustaining the alliance until the next election. Not being able to bear that burden, most eliminated coalitions have either dissolved or hibernated until the next election. Winning coalitions have been the only ones that were able to survive after elections; and they survived only partly and until the end of presidential terms. The major disadvantage of presidential election in Afghanistan has been that the president is naturally likely to belong to one ethnic of the groups only. In the past three presidential elections, only Pashtun candidates were able to become the president. This has led to criticism of the constitution by other ethnic groups, who have found the office unreachable by non-Pashtuns. These ethnic groups have further mobilized against this system in the presidency of Ghani, whose government and policies have been considered less and less inclusive. Notably, they have witnessed that the government’s uncompromising policies such as those of ID cards, elections, districting, security, corruption, and power line mostly coincide with the demands and concerns of Pashtuns vis-à-vis those of other ethnic groups. They perceived these policies non-conciliatory, ethnocentric, and favoring Pashtuns only. Therefore, many have associated presidentialism with ethno-authoritarianism in Afghanistan and advocated for replacing the system with a parliamentary or semi-parliamentary system. To them presidential elections are zero-sum games, in which non-Pashtuns are always the losers (Table 4). Afghan Constitution has set a presidential term limit of two 5 years: Article 61 sets a timeline of every 5 years for presidential elections; and Article 62 mandates that an individual cannot be the president for more than two terms. So far, only president Karzai completed a second term. As the head of the third administration, President Ghani is in the final years of his first term should he run for a reelection and win. There is a scholarly consensus that presidential term limits are necessary for preventing monopoly and abuse of power in a presidential democracy (Martinez 2015; Neale 2009; Davis 1980; Nogare and Ricciuti 2008). Without term limits, presidents have tendencies toward monopoly of power which usually leads to ethnic monopolization of power. Additionally, being unaccountable to the public, presidents are likely to abuse their power for personal and ethnic interests; in such situations, minorities are likely to be marginalized and eventually mobilized against the system instigating civil wars. Therefore, not surprisingly, presidential term limits are not unique to the Afghan Constitutions. The length of a presidential term has been as much subject to debate as the reelection of a president. Shorter terms are more likely than longer ones to reduce electoral tensions since with shorter terms the losing parties are more likely to concede defeat and wait for the next election instead of contesting the lost election’s result; however, with longer terms the president would be free from distractions associated with frequent electoral campaigns for the next elections (Neale 2009, 22–23). There are some issues with term limits, however. One such issue is that the permanence of presidents in office is fixed: once elected, a president will remain in office for the full constitutional term until the next election. In that period the president cannot be removed regardless of whether or not he or she has the confidence of the assembly of his or her own coalition, which is very different from a parliamentary system where the survival of the executive depends on its parliamentary coalition holding together. Therefore, it is safe to argue that presidential terms limits in a way undermine the accountability of an incumbent to his or her coalition. This is best illustrated by the shifts in the ethnic composition of cabinets during cabinet reshuffles in Afghanistan. In all three administrations, when reshuffling the cabinet, the presidents have been tempted not to keep their promises to their electoral allies. This has led to the cabinets becoming less reflective of pre-electoral pledges after each reshuffling. Table 5 shows that cabinet reshuffles have led to an increase in Pashtun seats and a decrease in the seats of the next two largest ethnic groups in all three administrations. It cannot be a coincidence that in all three administrations, the presidents happened to be Pashtuns. This also explains why after each reshuffle the allies of the presidents were likely to become fierce oppositions of the government, failing the incumbent coalition to survive the full term. Source: The information is gathered by the author from a number of sources including Afghanistan Analyst Network, Afghanistan Research Evaluation Unit, and Afghan Biographies: Who is Who in Afghanistan? In their second terms, the presidents are even less likely to stay loyal to allies. The only second termer in Afghanistan, Karzai ignored most of his allies when making decisions or implementing policies in his second presidency. For example, after the 2009 election, he walked back on his promise to Mohaqiq to upgrade two Hazara-dominated districts into provinces. Karzai was frequently at odds with his close international allies as well (Druzin 2013). His relationship with the US government – his original backer – was at its worst late in his second term. In 2013, for example, Karzai declined to sign the Mutual Security Agreement between the United States and Afghanistan despite the fact that it was approved by supermajority in the Loya Jirga (an advising grand council consisting of members of the parliament, provincial councils, district councils, supreme court, and cabinet) and endorsed by his domestic and international allies. A coalition is not stable unless it prevails not only across elections but also across government branches, specifically the executive and the legislature. Coalitions in Afghanistan have neither survived across elections nor entrenched themselves across branches of government. This failure is partly explained by the time lapse between presidential and parliamentary elections in Afghanistan: they are usually held over a year apart. As a practical matter, nonconcurrent elections are less likely to encourage cross-branch coalitions than concurrent elections (Carey 1999, 93). In fact, numerous studies have shown that only those presidential democracies such as Costa Rica, United States, Chile, and Korea that hold at least partly concurrent elections have entertained stable party systems and coalitions (Jones 1995, 5, 75–77). The better performance of concurrent elections is explained by the supposition that while concurrent elections promote mutual campaign support, nonconcurrent elections encourage clientelistic coalitions. It is well established that during elections, both presidential and parliamentary candidates need alliances to endorse their campaigns. Under a concurrent election, the immediate interest of both the presidential and parliamentary candidates is to win the election; and therefore, the most likely term of agreement would be mutual campaign support. A mutual campaign support, unlike a clientelistic partnership, is likely to hold the coalition together primarily because candidates are likely to choose an ally who is closest to them in policy. Under noncurrent elections, where only presidential candidates need endorsements, MPs are likely to endorse them only in exchange for patronage. As a result, nonconcurrent elections lead to clientelistic, temporary, and thus unreliable coalitions. In fact, in the presidential election of 2014, some reports have shown that many MPs secretly vowed allegiance to multiple presidential candidates in exchange for patronage. Strangely, the 2004 Afghan Constitution merely encouraged rather than mandating concurrent elections. Article 160 of the constitution states, “Multilateral efforts shall be made to hold presidential and National Assembly elections concurrently.” Several attempts have been made to hold elections concurrently under the terms of this provision. However, from a constitutional perspective, the implementation of this article is almost impossible, considering the different timelines set for presidential and parliamentary elections by the same constitution. Article 61 of the constitution sets the date for presidential elections between March 22 and April 21. Article 83 sets the date for parliamentary elections between April 22 and May 22. By any interpretation, these timelines do not overlap, although they could come as close as 1 day apart, holding the presidential election on April 21 and the parliamentary election on April 22. Article 61 of the Afghan Constitution provides for popular election of presidents, stating that “[t]he President shall be elected…through free, general, secret and direct voting.” The Office of the President derives legitimacy from a nationwide election, and as such, on numerous occasions presidents have claimed that they represent the will of the nation better than MPs who are elected by separate and smaller constituencies. As such, Afghan presidents tend to believe that their policy positions are superior to those of the assembly, demonstrating little willingness to compromise with the legislature or form legislative coalitions. For example, in 2013, Karzai and his inner circle questioned the legitimacy of the assembly when he decided to refer the Afghanistan-US Bilateral Security Agreement to a Loya Jirga instead of the assembly for approval. This decision of the president indeed was in violation of Article 90 of the constitution, which provided that international treaties and agreements must be ratified by the assembly. However, Karzai’s spokespersons argued that due to electoral fraud and some “non-patriotic” MPs, the assembly did not have the legitimacy to approve the agreement. MPs confronted Karzai’s administration by pointing to the electoral fraud in the presidential election of 2009 that led to his presidency. Further, in protest to his decision, a large number of MPs decided not to attend in the Loya Jirga, calling it unconstitutional. Article 62 of the constitution, which lists the qualifications for presidential candidates, requires that a presidential candidate must be a Muslim. This clause sets a clear institutional discrimination against non-Muslim minorities including Hindus, Sikhs, and others. Afghanistan is one of very few countries that have an exclusionary clause in its constitution about the religion of the president. An additional electoral rule which has also led to a discriminatory consequence is Article 45 of the Election law. Article 45 requires presidential candidates to present the voting cards of at least 2% from at least 20 provinces to IEC to qualify as candidates. This requirement has likely impeded the candidacy of elites from many smaller groups since their presence is limited to much fewer than 20 provinces. Only Pashtuns and Tajiks seem to have a minimum of 2% inhabitants in at least 20 provinces. This perhaps explains why in the presidential election of 2014, only Pashtuns and Tajiks had presidential candidates. Hazaras and Uzbeks had presidential candidates in the presidential election of 2004 and 2009 when article 45 of the Election Law did not exist. Despite the initial intentions of coalition founders for consolidation, coalitions have remained weak and prone to dissolution. They have mostly failed to endure beyond single presidential elections. In fact, cross-branch coalitions were not formed because the only threshold for a coalition to form was winning presidential office. Sustaining the office has never been an issue under the presidential constitution. Once elected, keeping the government is guaranteed by the presidential term limits. Oppositions, empty-handed from elections, cannot afford to sustain their coalitions until the next presidential election. For these very reasons, most coalitions have been built on the basis of patronage negotiations and personal politics. Even so, Afghan presidential elections should take the credit for encouraging at least the formation of cross-ethnic coalitions. Unlike the parliamentary elections that have exacerbated personalistic politics, the presidential elections of Afghanistan have given rise to coalitions that have transcended ethnic boundaries. These coalitions have indicated the prospect for political development in Afghanistan as their emergence demonstrated popularity, cross-ethnic appeal, and political accommodation by elites. The tradition of coalition-building has become firmly entrenched in the presidential elections of Afghanistan. Over the last three presidential elections, around 16 broad coalitions have emerged, most of them cross ethnic, officially declared, and having charters with the intention of further consolidation. Presidential elections have raised the threshold so much that only the largest and the most inclusive coalitions could win or be the runner-up. Ethnic coalitions were marginalized and ethnic “parties” even more so. Of the four large ethnic parties, only Jumbish-i-Islami remained somehow intact. Jamiat-i-Islami Party, Hizb-i-Islami Party, and Wahdat-i-Islami Party split into several factions, each faction joining one or the other cross-ethnic coalitions. As a result of the fragmentation of ethnic parties and the formation of cross-ethnic parties, Afghans for the first time in history witnessed inclusive governments (see Table 2). Since all this development has taken place within 18 years of democratization, it begs the question whether the continuation of presidential democracy may eventually lead to the institutionalization of cross-ethnic coalitions in Afghanistan. In fact, none of the presidential democracies that entertain strong party system or stable coalitions including the United States, Korea, Colombia, Costa Rica, Venezuela, Chile, and Uruguay (prior to 1973) have done so within a short period of 18 years. If that is the case, why should we not let coalition development take its course under the same presidential features? The risk of wait-and-see approach is that it may allow democratization to take a reverse path. Democratization is a fragile process that may easily be reversed (Pridham and Lewis 1996, 1). Even worse, this approach may allow the culture of patronage politics to become entrenched in Afghan political society, which is, unlike democratization, hardly reversible. Therefore, in today’s democratizing societies, engineering and reengineering of constitutions are essential to strengthening democratic institutions in shorter pace of time. In light of these observations, further research is required to examine what constitutional solutions most properly remedy the problematic features of Afghan presidential elections.